At some point in our working life we may be asked to put together a slide show or deliver a presentation, but have little or no experience. 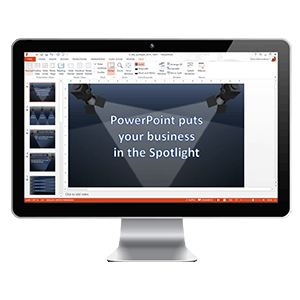 Our Introduction to Microsoft PowerPoint training course will give you the skills and confidence to create your own effective slide show. On the course you will be introduced to the many useful features of Microsoft PowerPoint. During the session you will create and format text based slides and produce an animated screen show. The course uses structured hands-on exercises so you can practice the skills you have learned throughout all the sessions. This course is the ideal stepping stone towards our Advanced Microsoft PowerPoint course. To get the most out of this course no previous experience of slide shows is required but ideally you should be comfortable with the Microsoft Windows environment. Please contact us to make a booking or book now on-line. All courses are available for both scheduled (open) and dedicated (bespoke) delivery. Please contact us for details and pricing.